"Well sure," you say, "those tools are great for European farmers who have (he manufacturer next door and can get parts and service with no problem. What about small farmers in the United States who can't wait to send for a part overseas?" Taking seriously the small-scale farming market and the skepticism against investing in foreign equipment, some companies (like Kubota and Pasquali* for instance) are setting out to solve that problem. For example, the Pasquali Company in Barcelona, Italy is establishing an arm of its company in Verona, Wisconsin called Pasquali U.S.A. Instead of passing through the hands of an importer, a distributor, and a dealer, all of whom handle a variety of products, Pasquali will serve as both importer and distributor and will handle only Pasquali products. They will stock every part that would be found at the manufacturing plant in Italy, so that a dealer need only send to them for a part and be assured of the same service as if they were dealing with a Detroit manufacturer. As for service, Pasquali U.S.A. is planning a training program for its dealers right at the manufacturing plant in Barcelona. All this is great news to the small-scale farmer. Not only does it lend credibility to foreign products as worthwhile investments in the future in North America, but it stimulates the competitive spirit in our own free-enterprise system. We have had many requests for this book from United States manufacturers who are interested in new product lines. If the market reveals itself, many will jump at the chance to satisfy it. As we mentioned earlier, John Deere, Allii-Chalmers, and Massey Ferguson are contracting to sell Japanese-made intermediate tractors under their own names. The ball is already rolling. There's no reason for this marketing approach to stop with tractors. Meanwhile, study the foreign alternatives as prospects of things to come. The simplest hand-operated planters are the walking stick type, most suitable for planting seeds at wide spaehigs or for interplanting. They can be used in quite rough seedbeds so long as the ground is soft enough for the stick to be inserted. A hand-pushed, wheeled seeder normally requires a well-prepared seedbed for easy penetration and uniform placement of seed as well as ease of operation. 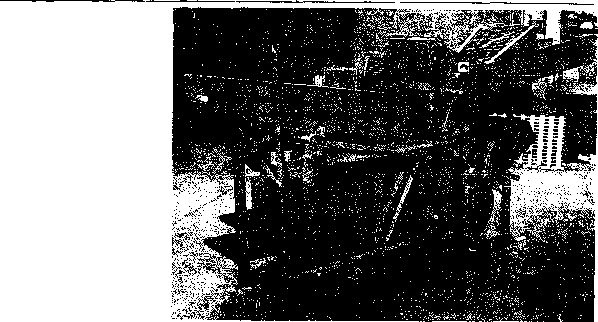 Two or more of these seeder units may sometimes be mounted on an animal-drawn tool bar. After hours of back-bending labor, Don Green, a Michigan gardener, decided there was an easier way to put hit seed. * in place—to make an extension of his hand. Using the top part of a l/o-gallon plastic container and a plastic tube used in a golf bag to protect the club shafts, he created a seed funnel. 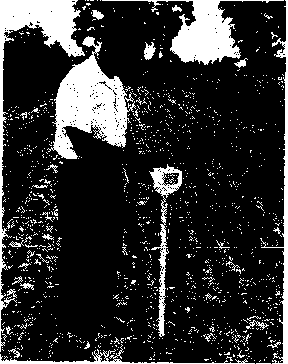 Total cost was 18 cents, and his device can be used to place rock fertilizers or shrubs or garden plants too. 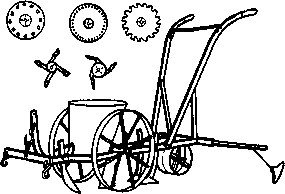 The simplest animal-drawn seeders consist of a cultivator-type tine carrying a tube through which seeds are dropped by hand. These implements ensure that the seeds are sown in lines at approximately constant depth, but the spacing along and between the rows depends entirely on the operator's skill. Single-row and multirow versions are available. Most units are fitted with a reversible, adjustable marker. Animal-drawn planter witk mechanical seed-metering plates. Animal-drawn seeders with mechanical seed metering arc of two types. 1. Those planting several rows at close spacing are commonly used for grain crops in humid or irrigated areas. 2. Single-row machines are generally used to space seeds at wide intervals in drier areas. Various mechanical seed-metering systems are used. A rotating brush or agitator controlling the flow of seed through an adjustable opening will handle most types of seeds with minimal damage, as will contrarotating soft rollers, but these mechanisms do not closely control seed spacing in the roiv. Fluted roller feed mechanisms give more accurate control of the overall seed rate per hectare but, again, do not control spacing in the row. Cell-wheel and perforated belt-metering systems can give very precise spacing of seeds, particularly those which are approximately spherical in shape. The metal cell wheel is more likely to cause damage to delicate seeds than the flexible perforated belt. Some seeders can be adjusted to plant bunches of seeds at wide spacings.